Probate and Administration Attorney | Daniel J. Reiter, Esq. After a loved one passes away, you may find yourself without any idea what do next about your deceased loved one’s money and property. Daniel J. Reiter, Esq. assists clients in all aspects of probate and administration. Who is entitled to the decedent’s money and property? How does the money and property get transferred to beneficiaries? “Probate” is the process of proving to a Court that a “Will” is valid (if there is a Will). Administration is the process whereby the “executor” of the Will, or the “administrator” of the estate if there is no Will, takes the necessary steps to transfer assets from the name of the decedent to the names of the beneficiaries. The process is not always easy, and the proposed executor or administrator must petition the Court for authority to act, must often account to beneficiaries, keep accurate records of assets, pay taxes, and deal with countless other matters. Some property, called “nonprobate” property, is not subject to the court supervised process of probate and administration. For instance, generally, if a bank account has a named beneficiary (e.g., “payable on death” or “transfer on death” to a specific person), the process of procuring the funds in that account is much more streamlined, generally providing the bank with a death certificate. A probate proceeding in New York Surrogate’s Court would not be required for that property. Certain property titled in a lifetime trust, or held jointly, also falls outside of probate. It is important that the surviving loved ones consult with an attorney experienced in the areas of probate and administration, as there are many issues and considerations that may be unknown to the surviving loved ones. Daniel J. Reiter, Esq., handles all aspects of probate and administration in New York. 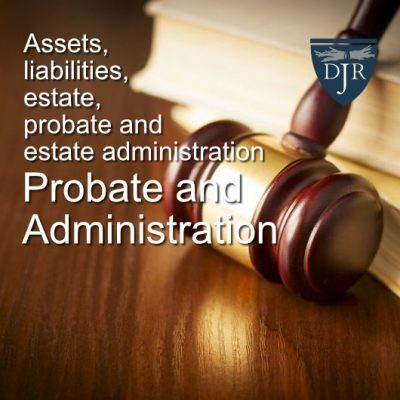 If you have questions about the probate or administration process, or need legal help regarding the same, you are encouraged to contact Mr. Reiter at 646-820-4011 or djr@djrattorney.com.